Provident was incorporated in 1996 by Michael Jagger to provide special event security services as a means to help cover University tuition. The company was started using a $500 limit on a personal Mastercard and has since grown to become one of Vancouver’s largest privately held, full-service security firms. With offices in both Kerrisdale and Whistler, we offer a complete range of services for residential and commercial clients including security and video system design, installation, monitoring and guaranteed response services. In addition, we provide uniformed security guards as well as a complete 24/7 concierge service. Since starting with our first client, York House School, in 1996 providing security at high school dances, Provident has grown to become the only security firm in Vancouver that offers a complete range of security services without contracting out any part of our operations. We own our own 24/7 central monitoring facility in Kerrisdale where we monitor alarm and video signals for more than 7,000 systems in Vancouver and Whistler. From our sales team to the installation, customer service, alarm dispatch and alarm response teams, every person involved in our client’s security is a Provident employee. Client information is never shared with outside companies. Provident’s unique approach to security has resulted in extensive media coverage throughout Canada and the United States. We have been featured in every major Canadian publication as well as USA Today and the New York Times. Click here to read some of our press. We’re proud to be a strong community supporter. In addition to sponsoring several Kerrisdale Little League teams and Vancouver Minor Softball, Provident supports Kids Help Phone and Baby-Go-Round. 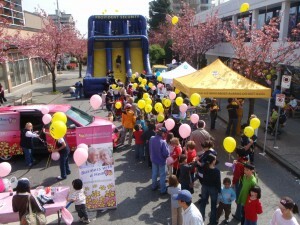 Our giant inflatable slide is a common sight at community events throughout the Westside and Whistler. We provide our slide free of charge to community events and have helped earn thousands of dollars for neighbourhood, school and community groups. Click here for more information about requesting our slide at your next community event.